Suitable for all kinds of optical film, adhesive tape, such as OCA, ITO and other adhesive and non-adhesive materials. 3. 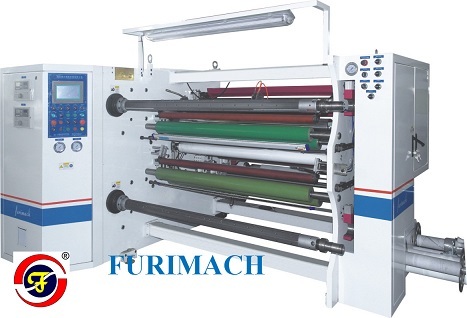 The main drive adopts roll pressing type to prevent material the material is not synchronized with the roller and make the tension of unwind and rewind cut off, so the whole tension is more stable. 5. All guide rollers adopts mirror treatment to avoid surface scratch and other unqualified products during slitting. 6. It’s equipped with dust device for both side of material to prevent dirt during production. 7. It’s set lights equably on unwind and rewind section to test material easily. 8. It’s equipped with finished products fast unloading device. 9. Waste collect system can choose left-right moveable surface rewinding type, servo motor control center rewind type and blower fan collect type. 10. Slitting blade can use air blade, shear blade, razor blade for different material slitting. 11. It’s equipped with cleaning device at exit of slitting blade to clean scrap after slitting. 12. The unwind system has EPC device which corrects it automatically when edge of coming material is not at the same level to meet reduction of wasting.